I hope you all enjoy reading this and gaining an insight into the workings of a writer as much as I did, and thanks again to Joelle for agreeing to take part! Tell us a bit about your background – how did you come to be a writer? I went to college and to graduate school for music and theater and for the next several years performed in operas, musicals, children’s theater and lots of other crazy acting and singing kinds of things. It wasn’t until about 8 years after college that I started writing. I was the only person in my dressing room for the show I was doing that didn’t make the next show and I suddenly had an opening idea for a book in my head. And for some crazy reason I decided to write that book. It was a bad book, but I decided that I loved the challenge of telling a story and kept going. EVERYTHING! Honestly, I am inspired by great stories, by music, by my voice students, by my son’s laughter and by the kindness of the people I have met throughout my life. The world is filled with inspiring things and I find something new to be amazed by each and every day. 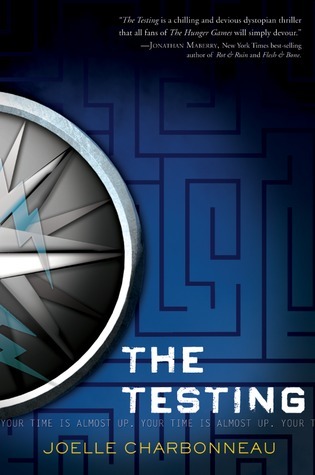 Your ‘The Testing’ trilogy is set in a dystopian future, where do your ideas come from? The idea for THE TESTING series came out of my work with my voice students. I work one on one with teenagers on their singing. Many of those teens decide they want to go to college for singing or acting and then I work with them on their college auditions. The process is stressful and the stress can often overwhelm them. One year, I found myself wondering how the process could become more stressful. I wanted to know under what circumstances the world would turn the process of getting into college into something that could mean life or death. And the Testing was born! Cia is a great character – she’s strong, smart and balanced. How did she develop throughout the trilogy? Is she based on anyone you know? One of my students at the time I came up with the idea for The Testing is 5’2″ and has dark hair. So, I guess Cia’s outward appearance is probably based on her. But Cia’s starting point for her journey is really based on all of my students. They are all optimistic about the world and their future. Most of them come from good families. I wanted Cia to represent them. I also wanted her personal character growth to reflect what I see in my students as they go off to college and learn that the world is more complex and harder than they originally thought. They become more balanced and more confident. They also experience a lot of painful growing moments and come out the other side a little less happy, but a whole lot wiser. The middle! The middle of every book is really tough. The beginning of books are always interesting and engaging and the idea is fresh and new. The end of books are exciting because you’ve scaled the mountain. There is no better feeling than THE END. But the middle is where your doubts and unhappiness creep in. The middle (no matter how fast a writer writes) is always long and scary and filled with uncertainty. I am reading Jason Reynold’s WHEN I WAS THE GREATEST. It’s awesome. The Lion, the Witch and the Wardrobe. It is still quite possibly my favorite book and the one that taught me to believe that anything is possible! As a writer, what’s the one thing you can’t live without? Diet Pepsi…honest! I need my Diet Pepsi. I am currently working on proofing my next book which is a young adult thriller called NEED, which involves an elite social networking site that allows anonymous users to say what they need and offered them a chance to get it. I’m also writing a brand new stand alone YA thriller that has the working title of MASKED. I’m closing in on the middle section. Wish me luck!